Birthday card design software creates and prints birthday greeting cards in different shapes, sizes and colors according to your need. 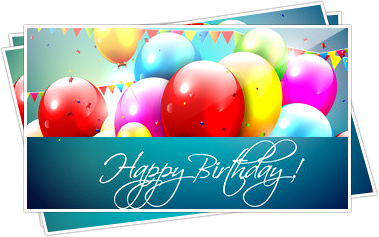 Birthday Cards Design software designs your own birthday card with option to add text, photos and other image designing objects to create attractive birthday cards. Birthday card designing program is developed with inbuilt email feature to send designed cards at specified email. Choose Card Designing Software and design your own style of Id Card, Business Card, Birthday Card, Greeting Card, Wedding Card etc. Card and Label maker Software generates different kinds of stickers and labels including Shipping labels, Address labels, Business labels, Warning labels, CD and DVD labels. Program has feature to save designed card and label log file for future reference. Business Cards Design software generates business cards like corporate business cards, marketing business cards, personal business cards etc in different shapes and sizes. You can design and print double sided card (Front and Back side). ID Cards Design Software is useful to create and print id card of any dimension with option to add barcode, signature, photo for student, employee, faculty and staff members. Software provides Live Group and Batch Processing Mode for designing different types of ID cards like Employees ID card, Visitors IDs, Students IDs etc. of group of people using Excel data file. Software designs and prints multiple students Id cards with different barcode value and text. software provides option to choose ID card design from Pre-defined templates also. Software designs visitors ID cards and Gate Pass for the visitors. Software provides Image Cropping Tool to crop images while designing id card for your visitors. Greeting Cards Design software craft various greeting cards in different shapes including rectangle, ellipse and rounded rectangle as per requirement. Greeting Cards Maker Software provides flexible print settings to print designed greeting cards. Wedding card maker software designs marriage invitation card of any size, shape and color using image designing objects for inviting your friends and relatives. You can also send designed wedding invitation card at specified email addresses using advanced email settings. Software enables users to make your own style customize logo as well as professional brand identity symbol for any small to large scale business industries. Logo Designer Program provides various image designing objects to design and create professional logos.